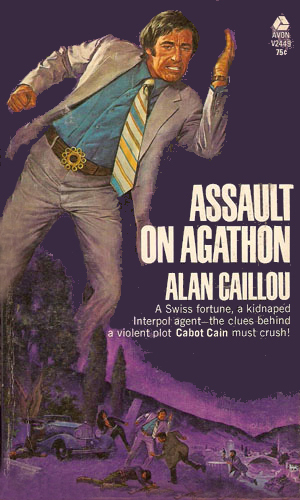 Cabot Cain is an agent for Interpol. To be more accurate, he is a freelance operative who works almost exclusively for Interpol, Department B7, handling tasks that most others would walk quickly away from. These assignments are usually presented to him by his close friend and former associate, Colonel Fenrek. It is Fenrek that Cain uses to help provide needed background information to discern the good guys from the bad. It is Fenrek that sometimes has to prod Cain into taking an assignment if it doesn't sound interesting enough at the outset. Cain is a big man. A really big man. He stands 6'7 and weighs in the neighborhood of 240 lbs. He remains in excellent physical shape due to an almost fanatical exercise regimen which includes, when time permits, jogging 5-10 miles at a time. 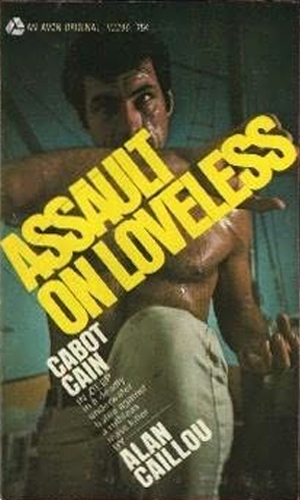 As further proof of his dedication to conditioning, at one point while awaiting the pleasure of a beautiful woman in his hotel room, Cain spent the time doing 450 pushups! Cain doesn't need the job as he is independently wealthy as well as quite educated, having been a visiting professor at several universities. He once remarked that he took the time to achieve a Master's Degree in Petrology just for fun. He is also an expert with flowers and loves them enough to take the time to actually look at them, even if he tends to critique their soil or their nutrients or such. Though he doesn't need the work, Cain does need the excitement that his job brings him and the challenge of going up against bad people and winning. Despite the way that this makes Cain sound, however, he is not a narcissist nor an egotist. He knows well that his large size makes him an obvious target and he wants to ensure that he has the ability to get out of trouble. Cabot Cain is asked to track down a renegade Communist killer who has taken refuge in a remote Brazilian community controlled by former Nazis and other societal rejects. 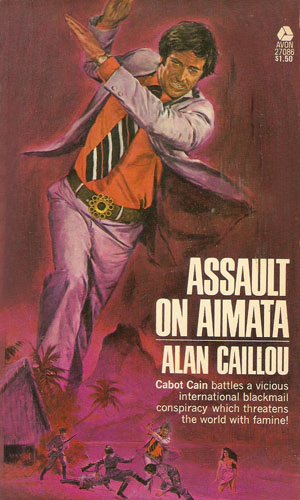 Cabot Cain agrees to act as the bodyguard of a beautiful woman but she is soon kidnapped and held by an evil genius that Cain must now go up against. Even as Cabot Cain and his friend Fenrek of Interpol track down a merciless killer and mercenary named Loveless in Portugal, the prey is stalking the hunters. Ahmed Fellawi likes beautiful women and he has a stable full of them. He also likes to sell them for lots of money. 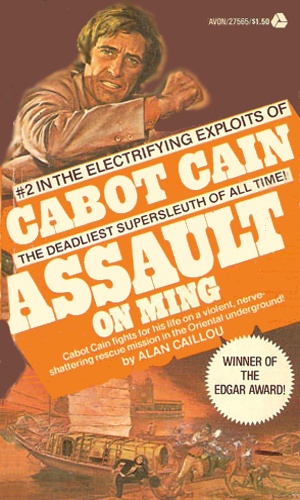 One is a woman Cabot Cain is sent to rescue. Agathon is a Greek guerilla fighter thought dead for 20 years who has been found by Fenrek of Interpol. Now Fenrek is Agathon's prisoner and Cabot Cain is out to set him free. The world is in danger of starvation if the plans of a madman to unleash a plague of insects is allowed to happen. 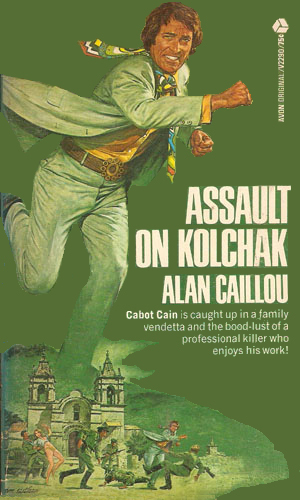 Cabot Cain is given the job of stopping him. 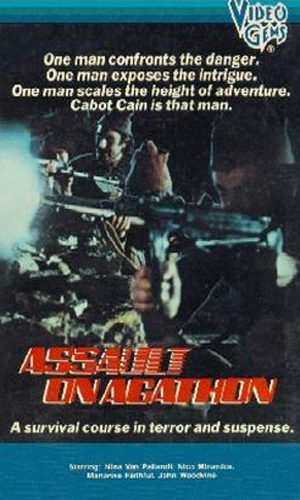 When a guerrilla leader from WWII, thought dead, reappears in the Balkans looking to start a revolution, Cabot Cain from Interpol is sent to investigate. 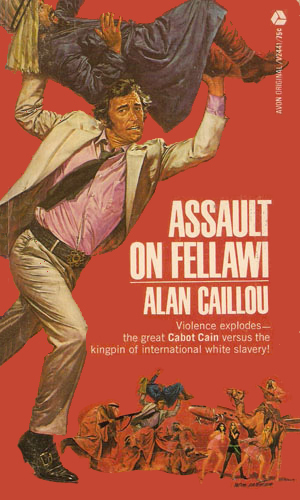 Alan Caillou never received the best-seller status he deserved for his writing and the Cabot Cain series is the best example of this. His characters are understandable and believable. His plots are straight forward and realistic. His writing style is highly enjoyable and compelling. The critics must have thought so because he was awarded an Edgar for one of the Cain books, and rightly so. Nevertheless, none of his characters ever became as famous as they should have been. Cain is the kind of man you'd love to have as a friend and his adventures are the kind you'd hate to have to deal with. Cabot is an honest man who had strong convictions about right and wrong and isn't afraid to stand up for his beliefs. By the same token, he can lie with the best of them to get in close to the bad guys. I really liked this series and was sorry there had not been more books written. Six books is nice but more would have been appreciated.